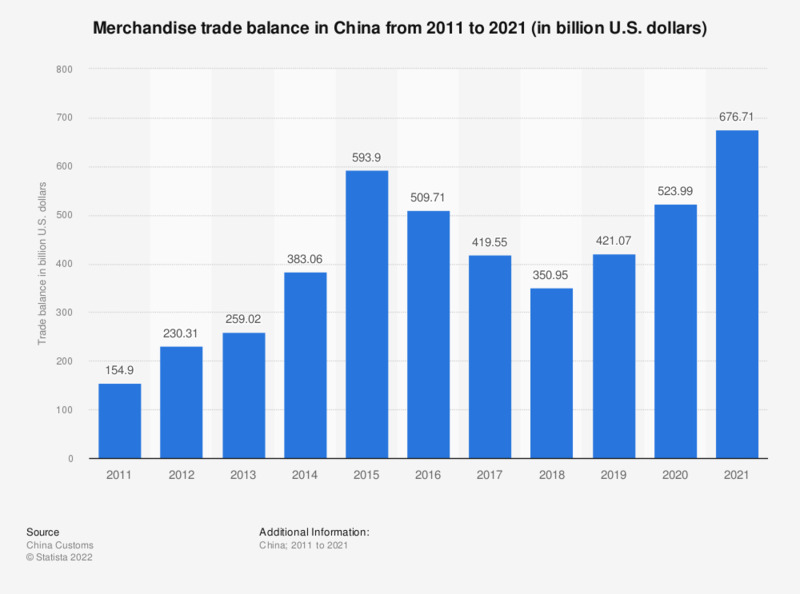 The statistic shows China's balance of trade from 2007 to 2017. In 2017, China's trade surplus had amounted to around 421.44 billion U.S. dollars. The trade balance is the value of exported goods minus the value of imported goods. A positive value indicates a trade surplus, while a negative value indicates a trade deficit. In 2014, Chinese imports of goods had amounted to approximately 1.96 trillion U.S. dollars, whereas total exports added up to about 2.3 trillion. In contrast, China’s invisible trade balance, an indicator measuring services and government transfers between countries, closed with a deficit and ranged at about -90 billion U.S. dollars at the end of 2013. Being an economy heavily reliant on export, China ranked second among countries with the highest trade surplus in 2013, only outperformed by Germany. The United States, with imports exceeding exports by approximately 750 billion U.S. dollars that year, ranked first among leading import countries worldwide. In 2013, the U.S. was one of the most important trade partners for the Chinese economy. Another important trade partner for China is the European Union. By 2013, the EU imported more than twice as much from China as they exported there, showing a trade deficit of more than 130 billion euros. Product categories with the highest trade deficit in 2013 were mostly finished goods such as manufactured goods, machinery and clothing, whereas product categories with a more balanced trade sheet consisted of raw materials and agricultural products to a large extent.